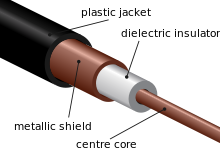 Four-conductor shielded cable with metal foil shield and drain wire. A shielded cable or screened cable is an electrical cable of one or more insulated conductors enclosed by a common conductive layer. The shield may be composed of braided strands of copper (or other metal, such as aluminium), a non-braided spiral winding of copper tape, or a layer of conducting polymer. Usually this shield is covered with a jacket. The shield acts as a Faraday cage to reduce electrical noise from affecting the signals, and to reduce electromagnetic radiation that may interfere with other devices (see electromagnetic interference). The shield minimizes capacitively coupled noise from other electrical sources. The shield must be grounded to be effective. The shield must be applied across cable splices. In shielded signal cables the shield may act as the return path for the signal, or may act as screening only. High voltage power cables with solid insulation are shielded to protect the cable insulation, people and equipment.